Picture Blast have recently launched the latest most mordern and sleek photo booth ever. Picture Blast are the UK leading Photo Booth hire company in the UK, they have been established since 2008 and have an impressive client list such as household names such as River Island, Barclays and Krispy Kreme to name a few. The Media Pod from Picture Blast is designed with corporate events in mind. The Selfie Media Pod offers all the features you would want for a brand promotion to a conference or corporate party. We can also now do surveys from the Media Pods what is more fun way to collect data for your business? The Media Pod can be set to have pictures or gifs in many different styles and all the images can be fully branded with logos, text and colours. 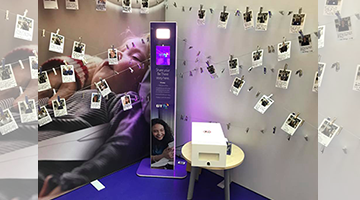 The Media Pods favoured by clients such as BT & Marks & Spencers can allow the user to share their images via social media, email and imessage allowing full exposure to the brand that is being promoted. The Media Pod also allows for instant printing meaning that your guest get to take a branded mometo home with them. The Media Pod can also be branded using any design, this is a great way to make the pods fit your event perfectly. The Media Pod takes up less space than a conventional photo booth meaning that there is no event that can not accommodate the Media Pod. The Media Pod can be hired for a few hours, days or weeks anywhere in the UK, we have a specialist team of staff that can install and be on hand for the duration of any hires to ensure that the booth is used to its full potential.